Barbara Loftus is a figurative painter and film maker who also makes artist’s bookworks. She combines a traditional studio practice with performed re-enactment, historical research and digital media to feed into her image making process. 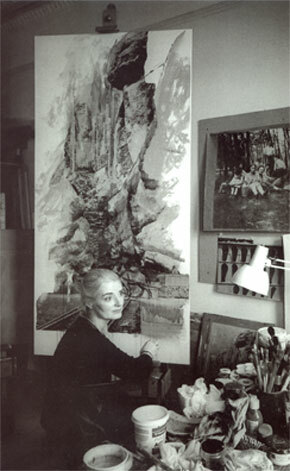 The theme of her current work is the convergence of personal memory and major historical events. Her mother Hildegard’s long-held silence, only broken in 1995, unlocked a door into the spirit of a ruined Europe, recounting personal experiences of growing up as a Jew in Germany during the inter-war period. Through a series of visual narratives which take the form of paintings, graphic sequences and bookworks, she constructs a visual interpretation of trans-generational memory, mining the experience and perceptions from two generations divided in time by the second world war – her mother’s and her own. Her focus on specific details of everyday life frames significant memory images that have the capacity to act as historical ciphers of human experience. Verschollen: A painters exquisite, forensic repossession of her missing family. Published by Phillip Wilson Publishing to coincide with the exhibition at the Freud Museum. 111 pages 55 illustrations.